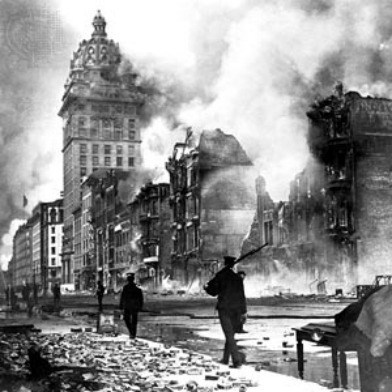 One of the last three known remaining survivors of the catastrophic 1906 earthquake in San Francisco attended a special dinner Wednesday as the city gets set to mark the 107th anniversary of the disaster. Bill Del Monte came this afternoon to John’s Grill on Ellis Street, where an annual survivors’ dinner is held the day before the anniversary of the quake on April 18, 1906. Del Monte, who was born in San Francisco three months earlier on Jan. 1, 1906, held court at the restaurant with Fire Chief Joanne Hayes-White, greeting well-wishers who came up to talk to him. The survivors’ dinner was preceded by a short parade starting at the Westin St. Francis Hotel on Powell Street, and will be followed on Thursday with an early morning memorial at Lotta’s Fountain on Market Street. This year will be the first that no survivors will attend the memorial, scheduled for 5 a.m., shortly before the 1906 earthquake shook the city, according to Lee Houskeeper, an organizer of the event. Del Monte and the other two survivors, Winnie Hook and Ruth Newman, will sleep in rather than wake up early for the event, Houskeeper said. “We’re absolutely thrilled we’ve had survivors with us for this long,” he said. On Thursday, city officials will also take part in the annual painting of the fire hydrant at 20th and Church streets that helped to save the Mission District following the quake. A breakfast will follow at Lefty O’Doul’s restaurant on Geary Street, while Mayor Ed Lee, Hayes-White, police Chief Greg Suhr and other city officials will also celebrate the topping out of the new Public Safety Building in Mission Bay at 10 a.m. In Golden Gate Park, Olympic gold medal-winning ice skater Kristi Yamaguchi and former 49ers wide receive Jerry Rice will join American Red Cross and PG&E officials at a disaster preparedness event in front of the California Academy of Sciences at 55 Music Concourse Drive. The “prep rally” that starts at 9:30 a.m. and runs through 1 p.m. will highlight safety measures residents should take before an earthquake strikes, and will provide attendees with a preparedness kit and tools to implement a disaster plan. The local celebrities are part of an effort to encourage residents to be ready for an earthquake. Rally attendees will receive free entry until 2 p.m. to the museum and its earthquake exhibit. At the exhibit visitors can experience a realistic high-magnitude jolt, which safety officials hope will prompt residents to get prepared for the next big quake.